Interest rates are rising in many of the world's major developed economies, with one big exception: Japan. The world's third-biggest economy is stuck with negative interest rates and an enormous easy money program. That contrasts starkly with the United States and Europe, where central bankers are more focused on how quickly to hike rates and wind down the massive stimulus measures they introduced after the global financial crisis. The reason for the difference is inflation. Or in Japan's case, the persistent lack of it. Inflation has been steadily rising in both the United States and Europe over the past couple of years. Mild price increases are seen as positive because they encourage consumers to spend, generating more economic activity. But since Japan's economic bubble burst in the early 1990s, prices have mostly been stagnating or falling. That's bad news economically because declining prices encourage consumers to put off spending. "If you're 40 years old, you've spent half of your life in a world where prices tend to fall rather than increase," said Takuji Okubo, managing director at consultancy firm Japan Macro Advisors. It's a tough mindset for many Japanese consumers to shake off, in Okubo's view. The Bank of Japan has resorted to a number of drastic measures to try and deal with the problem. The moves were led by the central bank's governor, Haruhiko Kuroda, who's expected to be reappointed to the job this month as his first five-year term comes to an end. Under Kuroda, the bank embarked on a huge buying spree of government bonds in 2013 and stunned markets by expanding it the following year. The aim is to push down borrowing rates and encourage companies to invest more. The approach means the bank has spent a staggering amount of money: its holdings of Japanese government bonds have soared by more than 330 trillion yen ($3 trillion) since Kuroda launched the stimulus program. Because of the huge purchases, the central bank now owns almost half of the entire Japanese government bond market, according to data from Japan Macro Advisors. In early 2016, the central bank took another extreme step, moving one of its key interest rates into negative territory, an attempt to prod banks to stop hoarding cash and lend more of it out to businesses and consumers. Bank of Japan Governor Haruhiko Kuroda is likely to have to keep Japan's monetary policy loose. Things have begun to change, but only very slowly. Inflation in Japan has picked up in recent months and reached almost 1% at the end of 2017 -- its highest level in years. But it took a huge amount of effort just to get there. And Kuroda wants inflation closer to the bank's target of 2% before he seriously considers turning off the money spigot. The central bank left its policy unchanged Friday following a two-day meeting. Marcel Thieliant, a Japan expert at Capital Economics, said he expects the bank's stance to remain the same "for the foreseeable future." The Japanese economy is in decent shape. It has now grown for eight quarters in a row, its longest expansionary streak since the 1980s. But many experts are skeptical that it's enough to push inflation much higher. "Wage increases remain slack and many companies are having difficulties raising selling prices," said Harumi Taguchi, an economist at IHS Markit. Kuroda could have his work cut out in a second term. According to Okubo, Japan could fall into a recession within the next couple of years if global growth cools off. "Then they might have to do something very radical" to stimulate the economy, he said. 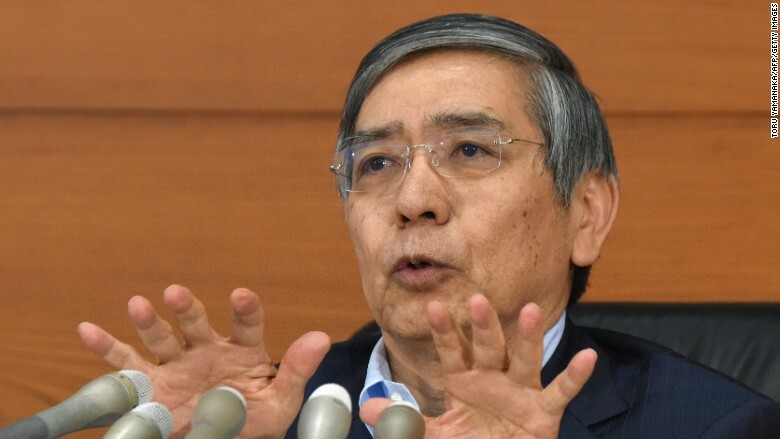 That might include pushing rates further into negative territory or even transferring cash into the hands of citizens in a controversial policy known as "helicopter money," something Kuroda has previously ruled out. Experts say the Bank of Japan can't solve the country's economic problems on its own. Economists want the Japanese government to push through big reforms, such as opening up the country's labor market. That could include bringing more immigrant workers into the aging Japanese workforce and removing barriers that make it hard for Japanese women to build careers. "It is difficult to create demand by monetary policy," Taguchi said. "Structural reforms are critically important to improving Japan's productivity." But Japan may have to wait a long time for those changes. Okubo suggests Prime Minister Shinzo Abe, who was re-elected in October, has bigger priorities such as his desire to pursue the politically sensitive path of revamping the country's military in response to the rise of China. "Abe talks about economic reform, but he doesn't really want to spend political capital on it," Okubo said.